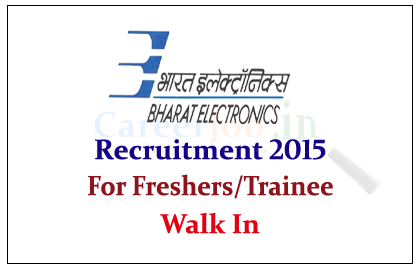 Bharat Electronics limited is recruiting freshers for the post of APPRENTICESHIP TRAINING (Mechanical, Electronics, Electrical, Computer Science, and Civil) for the year of 2015. 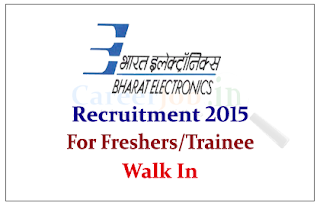 Interested and Eligible candidate can attend the Walk in Interview on 6th, 7th and 8th July 2015. Bharat Electronics Limited invites applications from outstanding experienced Software Development Professionals to work in areas of Advance System & C4I Architecture, Network Management System, Tactical Data Distribution and Ship Data Networking, Communication Protocols, Tactical Communication Planning, Remote Diagnostics, Persistent Database, Fault Tolerance Algorithms, Situation and Sensor Simulator, Multi Sensor Tracking, Multi Platform Multi Sensor Data Fusion, Tactical Data Link, Tactical algorithms including air space control, threat evaluation, weapon assignments, Display Technology, Software engineering, Modelling and Simulation, Tooling Technology ,for its Central Research Laboratory, Ghaziabad. Eligible candidates can attend the walk in interview on 6th, 7th and 8th July 2015 , For more details kindly check official Notification.